إن فندق هيلتون كوينزتاون ريزورت آند سبا بموقعه الممتاز في Kelvin Heights هو نقطة انطلاق جيدة لنزهاتك في كوينز تاون. يمكن من هنا للضيوف الاستمتاع بسهولة الوصول إلى كل ما تقدمه هذه المدينة النابضة بالحياة. يشكل هذا الفندق ملاذاَ مريحاً للاسترخاء ويمنح زواره فرصة للاستجمام والتجدد، وهو يقع على بعد خطوات من المعالم السياحية الكثيرة للمدينة كمثل: Lakes District Hospital, The Remarkable Sweet Shop, مطار كوينزتاون. يقدم هيلتون كوينزتاون ريزورت آند سبا خدمات لا غبار عليها وكل أشكال اللياقة وحسن الضيافة اللازمة لإسعاد ضيوفه. لضمان راحة ضيوفه، يقدم الفندق الخدمات التالية: خدمة الغرف على مدار الساعة, مكتب الاستقبال على مدار الساعة, مرافق مخصصة لذوي الاحتياجات الخاصة, تخزين الأمتعة, واي فاي في المناطق العامة . يمكن للنزلاء الاختيار من ضمن مجموعة من الغرف المصممة بعناية لتعكس جواً من الراحة، والتي يتجاوز عددها 178. إن مركز للياقة البدنية, ساونا, مسار جولف - ضمن 3 كم, حمام سباحة داخلي, سبا هو المكان الأمثل في الفندق للاسترخاء وتفريغ طاقتك بعد نهار طويل. إن هيلتون كوينزتاون ريزورت آند سبا هو خيارك لخدمة الفنادق الراقية في كوينز تاون. Me and my boyfriend enjoyed our time here in Hilton Queentswon. We were there to celebrate our anniversary and it was so sweet that the manager prepared a wine for us! The breakfast was fantastic; the spread was limited but the quality was top notch. The room was spacious, just that the lighting was not adjustable, hence it was quite dim to our preference. Also, the discounted water taxi is very convenient to us as it eases our transportation means. 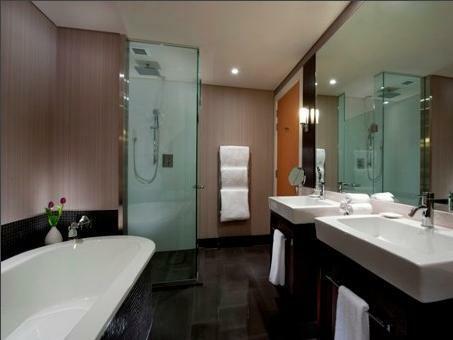 Overall, the quality of Queenstown Hilton matches the quality of other Hilton branches in other countries. I would definitely recommend this hotel to other Hilton loyal members and other visitors who are interested in a high end stay. Check in to our room and the rooms are different as shown on picture , swimming pool is small. Booked the 2 bedroom deluxe lake view, the master bedroom is big but the others room very disappointment as room is too small. Breakfast is nice and comfort bed. The staff were amazing and so professional. The hotel was beautiful and waterfront. Our only criticism was that the hotel felt severely under-staffed. Eg: We often waited 1 hour for room service, waited almost 1 hour for our suitcases to be collected for check out. Used room service dishes were left outside our room on the floor for hours despite us calling for them to be removed. One day a guest poo-ed in the pool and it was closed for 2(!) days (in peak Xmas period). It was a lovely hotel and we enjoyed it a lot but will try a different hotel next time. Pros: Room is spacious with 470sq ft plus with fireplace if you come during cold season. Hotel free shuttle bus around every 2 hours till certain time. Water taxi NZD 10/trip comes every 2 hours or so. WiFi is free if you are Hilton members. Indoor heated pool, steam, sauna and hot tub. Carpark is free but limited parking. We survived 8 nights without valet. A small 10 seated cinema showing 2 movies per day at Double Tree. Fantastic Lake Wakatipu view for you to stroll. 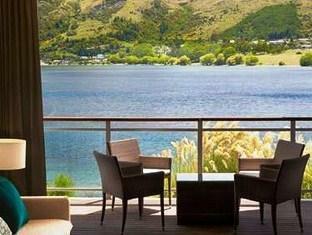 And not to forget, dine at Wakatipu Grill. The best I had in town ! Cons: Location is a bit far and dark winding road for last 5 minutes drive. Hilton always good. The hotel located outside town area so it is good to have your own vehicles. You can also use the water taxi to cross the wakatipu lake directly to the town by paying $10 per person. Disappointed with the service during stay. We had booked for a shuttle to town and we came down 5 minutes before 9am asking if the shuttle is coming. Staff said that they are bringing the shuttle around and did not mention specifically on where to wait. We went to sit at the lobby thinking the shuttle will pick its guests up from the lobby pickup point as any other hotels normally do. However, this was not the case and the staff had no initiative to check or bring to our attention that the shuttle was actually outside. You guys can possible expect guests to wait outside in the cold. At the very least, have some clear signs on where the shuttle pickup is. Service recovery for this was rather poor. Definitely did not expect this from Hilton. Other than this, we had a good stay at the hotel. Generally, the staff were helpful. The hot tub outside our room was a nice touch. Looked rather small though as compared to the pictures. The rooms are clean and the spacious. We were staying at the relaxation room. Pools were closed for maintenance. Breakfast had limited options considering this was Hilton and not doubletree. Had better options at other Hiltons. Our Relaxation room was large & spotless. Great bed,fireplace,awesome bathroom. The outdoor hot tub was very private with amazing view. The 2 ducks that visited us every morning completed the picture. Indoor pool & spa was an added bonus & the Wakatipu grill served a great buffet breakfast as well as an excellent dinner in gorgeous surroundings. We found all the staff at this hotel to be very friendly & helpful. Water taxi into Queenstown was a fun 10 minute boat ride for $10pp. Highly recommend this hotel. You're paying for the ambiance and the scenery. It's remarkable and the pictures can't do it justice. They have wider selection of food compared to other breakfast spreads which is also good. Issues are that for the amount you're paying, you don't get complimentary bottles of water per day which is ridiculous from such a high-end hotel. Internet is a bit slow. They take too long to pick-up calls for room service / housekeeping / inquiries. They charge you for local calls. Location is far from town and you'll have to shell out about 50$ per trip via cab. Still, I'd choose to stay here again in a heartbeat. Very peaceful vibe looking around the lake after breakfast, sitting and watching the ducks swim. Moments worth remembering. 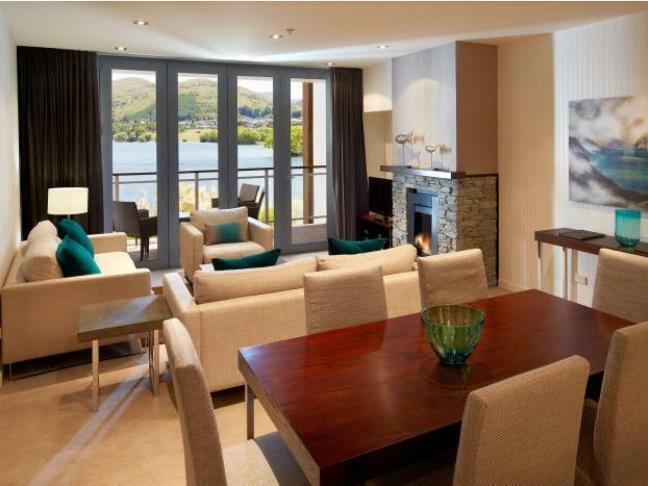 Great place to stay when you are in Queenstown. Location is 10 minutes drive from the town. As long as u have a car, it should not be a problem. Beautiful scenery of the lake and mountains. Room is clean and cosy. Highly recommended. We were upgraded to deluxe seaview due to fireplace malfunction in our original room. The staff make every effort to make up for the fault that help make our stay a memorable one. The hotel is quite a distance from the city centre but since we have a car, it was an enjoyable drive. A good base for exploring Queenstown if you do not mind the distance. It's worth a stay if you can get their promotion price. The hotel is located far from central but it's very convenient to reach only 5 min using taxi boat cost $10 per person and $5 for kids. The room of the hotel no need to explain further . only one word PERFECT! The view from the hotel is awesome, breakfast is amazingly worth for the price. Hotel is very near to airport. It was my first time to Queenstown. I like this Hotel very much. The room and overall are just excellent. The spacious and neat room made me feel very comfortable and homey. The Hotel is very close to the airport but a little distance to the main town. We had rented a car so it was not a matter at all. We enjoyed our stay and would come back to stay if we visit Queenstown next time. The hotel is located away from the city centre. It will not be a problem if you have a car. Great service. Love it. The swimming pool was also awesome. Great relaxation. Very good hotel experience other than souvenirs we purchased from Blueberry farm at Rotorua was mistakenly taken as part of the room service food tray condiments while being cleared by the hotel staff and was discarded by the hotel staff so we couldn't reclaim it. 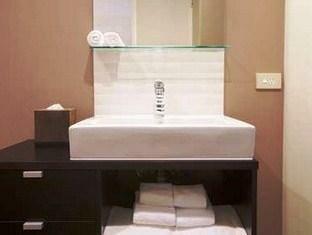 But hotel was very professional and efficient in reimbursing the cost of it. Unfortunate but hotel staff dealt with it well. We have no problems we going back to Hilton in Queenstown in a heartbeat. I had an unfortunate stay at the Hilton. I booked a room that showed pictures of beautiful views from the room with a large balcony, however when I arrived the view was obstructed and the balcony 1/3 of the size that the images showed. The management where useful and apologetic; they allowed me to check-out earlier than I had booked after they couldn’t find another room that matched the online description (and refunded me in entirety), however the nuance of dealing with the management team and finding another hotel at short notice wouldn’t have occurred if the room description was accurate. Because of this, I spent less time exploring the lovely Queenstown so naturally my stay at the Hilton was far less than I’d hoped for. 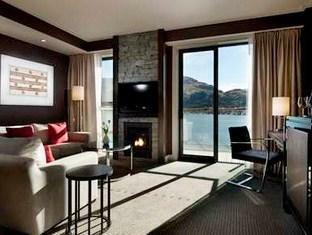 We stay at hilton queenstown for 5 nights. But we definitely will never comeback to this hotel. The location is too far from the city, and the free shuttle is limited to maximum 10 people. The shuttle schedule is only once every 2-3 hrs. On our first night, the shuttle van driver refuse to take my baby in his van. He said that he only can accept adult. But it didn’t happen to the other drivers for the next days. There is water taxi but it’s not free. If you go to city by Uber, it will cost you around 32 dollar and if you go by taxi, it will cost you around 45 dollar. The breakfast has not many options. Five days staying there, and the food were exactly the same. During breakfast, we need to pay for coffee or hot chocolates ( 5 dollar per cup). The carpark is very limited, especially if you drive a big car. 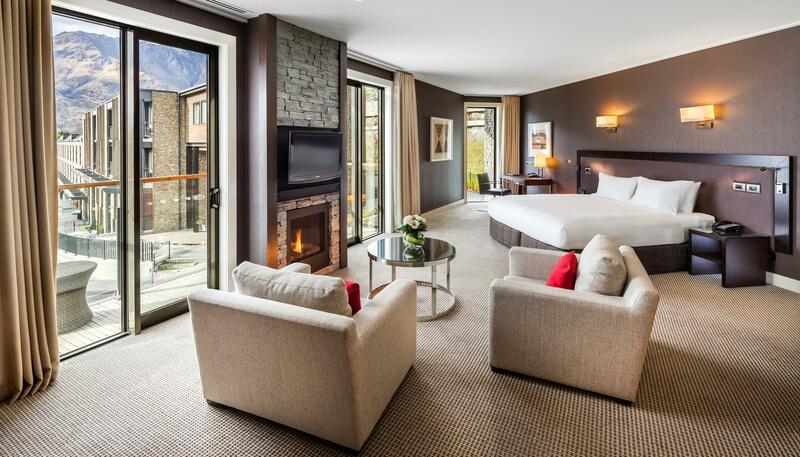 The Hilton in Queenstown just made our trip so special. When we checked in we were offered a $100 credit voucher to use at the restaurant and the food was amazing! We enjoyed going for walks around the hotel to a french bakery close by to get our morning coffees and croissants and then heading back to the hotel at the end of the day to relax with a book next to the fireplace in our room. Will definitely stay here whenever I come to Queenstown.